N.A.T. announces the NAT-PM-AC600, the AC version of the N.A.T. family of power entry modules for MicroTCA™. The NAT-PM-AC600 applications, offers power conversion from an 110/265V aito-range input source to 16 independent 12 V channels for payload power and 3.3 V for management power. This PM provides Shared Management Power (SMP) - backup power - for other PMs in the system and is designed to run up to 12 AMCs, 2 Cooling Units and 2 MCHs. 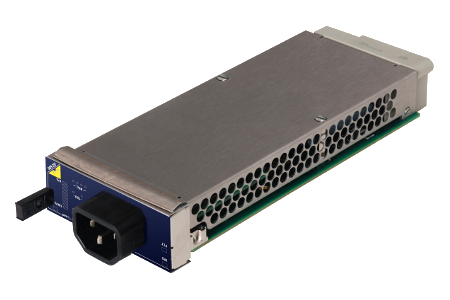 The NAT-PM-AC600 includes a robust Enhanced Module Management Controller (EMMC) that interfaces the power control functionality via the Intelligent Platform Management Bus (IPMB) to the MCH. The NAT-PM-AC600 supports redundancy as well as load sharing modes in accordance with the MicroTCA™ specifications. In case of an input power supply failure the power for the onboard EMMC can be provided by SMP power from other PMs, so that the MCH is able to analyse root cause failure. For N.A.T., the NAT-PM-AC600 is a further and consequent milestone in developing a broad and harmonized MicroTCA™ eco system. The PM serves as a central power converting and conditioning control block for entire sub-racks. N.A.T. offers sophisticated and standard compliant MicroTCA™ systems, either as turn-key solutions or building blocks. This offer is complemented by a large variety of own MCHs, telecom line interface and network processor cards, PrAMCs, I/O cards, chassis, CUs and PMs. For further details please visit the web site for the NAT-PM-AC600.